Very often, a customer will discover that his needs are not easily met with ‘off the shelf’ water treatment equipment. For example, the conductivity of the water might have to be held to a very precise level. Or, perhaps more than one type of treatment must take place at the same time, to satisfy water quality specifications for both the customer’s process and for any regulatory agencies. STI can design, engineer, manufacture, and install a one-of-a-kind system with our turnkey approach while eliminating costly consulting fees. Years of experience across multiple technologies enable us to provide a service to the customer that is guaranteed to be more efficient and cost effective for system design and fabrication. The components from our Aqua series of products combined with new and innovative technologies will yield the total solution for your process needs. STI is recognized as the leader in closed-loop water recycling. From our flagship product, the AquaCycler™, to the more conventional AquaMembrane®, and to the truly innovative AquaDischarge™ we are committed to solving process issues and providing cost effective solutions. 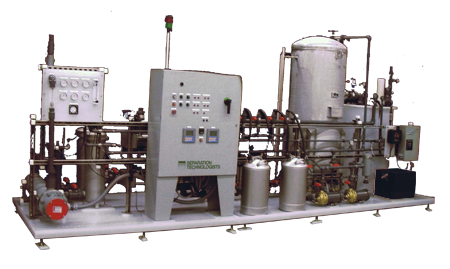 If your water treatment requirements do not fit readily with pre-engineered packages, call us today at 603-685-4108 and speak with our applications engineer for a custom engineered system that meets your unique needs. All of our Custom Engineered Water Conditioning Systems are fabricated from the finest components, built in the USA, and carry a full one year limited warranty.